Our friend, collector and author Mattias Rendahl, was kind enough to submit this article dealing with the release of the Emperor action figure in Sweden. It's a story I didn't know. Thanks to Mattias for sharing. PlayMix was the official General Mills subsidiary for the Scandinavian countries; they took over the Star Wars license from another company as late as 1982. Before this, basically no Star Wars toys had been sold in Sweden. In 1982, when PlayMix presented their product for the year, most stores didn't even want to buy Star Wars toys. They still had unsold stock dating from 1978-80. Therefore the folks at PlayMix were faced with a big task: to convince retailers to re-invest in Star Wars. Star Wars aired for the first time on national television around this same time. This, combined with some great marketing and sales initiatives on the part of PlayMix, caused the popularity of Star Wars toys to explode overnight; all of sudden Sweden couldn't get enough of them. PlayMix imported carded figures from all over the world, which explains why Swedish price stickers can be found on figures issued by Meccano (France), Clipper (Holland), Parker (Germany), Palitoy (Great Britain), Kenner (USA), and other companies. When Star Wars fever finally abated around 1987, PlayMix had sold over two million action figures -- a crazy number for a country of seven million people! The introduction to Sweden of the Emperor figure offers a good demonstration of PlayMix's marketing capabilities. On this occasion the PlayMix sales manager decided that, in order to generate some extra buzz and create demand for the figure, he would mimic the mail-away promotion Kenner had sponsored in the United States. He may also have taken inspiration from Palitoy's very similar promotion, or even by the introduction of the figure at the 1984 New York Toy Fair, an event regularly visited by PlayMix representatives. 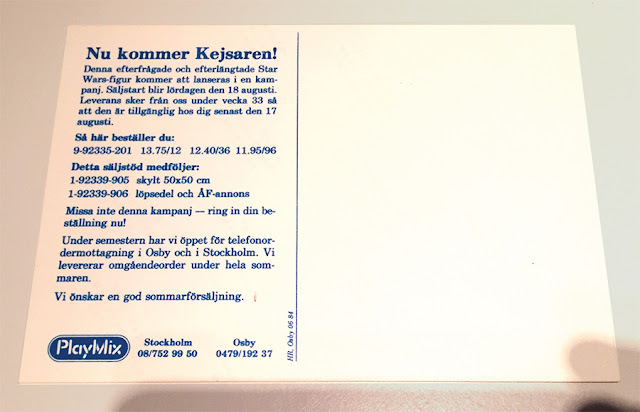 PlayMix set a specific release date for the Emperor and sent out a postcard to the most important toy stores in Sweden. This meant that only select outlets had the opportunity to carry the figure. The company also engaged in a bit of bluffing: They pretended they had a limited number of Emperor figures in stock, thereby encouraging retail buyers to order in quantity. Although PlayMix was a small, regional outfit, and they sometimes made mistakes -- such as photographing figures with the wrong weapons or accessories -- they really nailed this promotion. 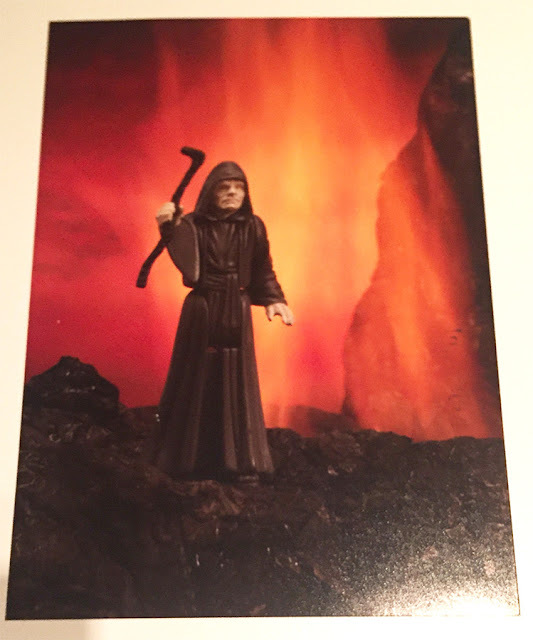 Their photo of the Emperor is not only amazing, showing the figure in an evil-looking volcanic environment, it foreshadows Revenge of the Sith and the fiery planet on which Anakin is slain. Perhaps the photo shows the Emperor as he arrives on Mustafar to honor his favorite Sith? This demanded and highly anticipated Star Wars figure will be launched in a campaign. Sale start will be Saturday the 18th of August. Delivery will be sent from us the week before its launch and will be at your store by the latest the 17th of August. Don't miss this campaign - call in your order now! During the holiday we have open for phone-orders in Osby and in Stockholm. We deliver orders during the whole summer. We wish you a happy and good summer sales. Most of the material supporting this promotion hasn't surfaced -- yet. The only related thing I've found is the ad slick you see above. 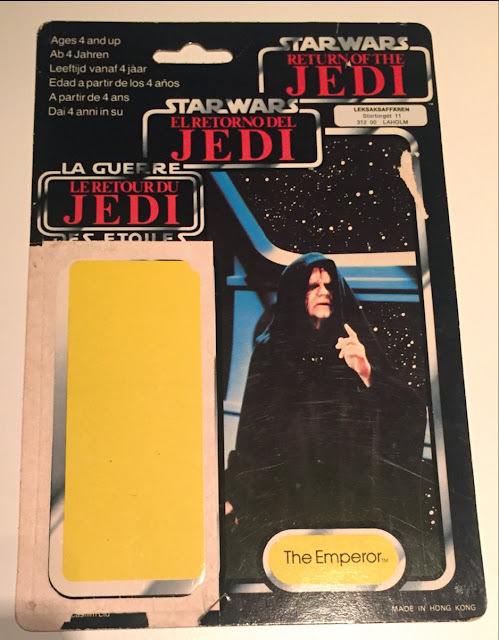 The slick is basically an advertisement that toy stores could reprint in their local newspapers to promote the Emperor's arrival. The blank spot would have been filled with the logo and address of the store running the ad. The text reads "The Emperor arrives the 18th of August!" To my knowledge, the display poster has never surfaced. However, a picture of one does exist. 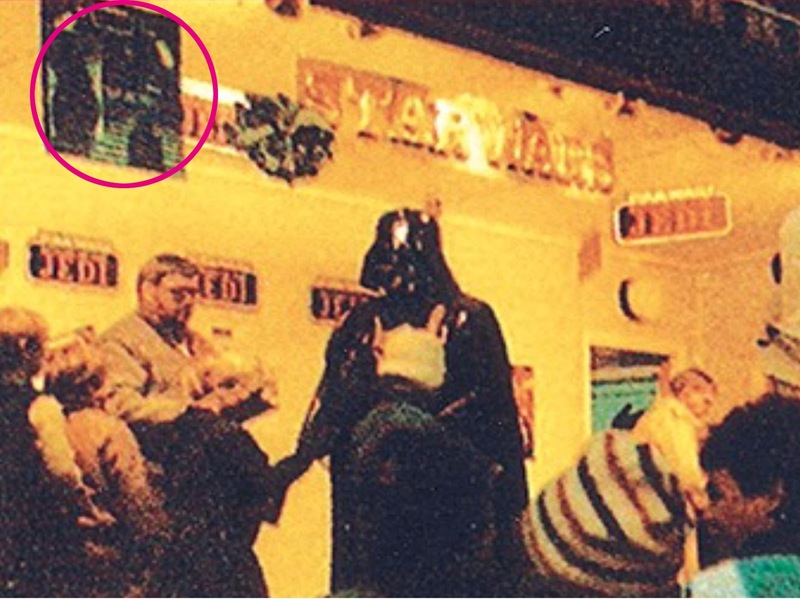 Though it's blurry, you can see that it features an image from the Emperor's throne room in Return of the Jedi. 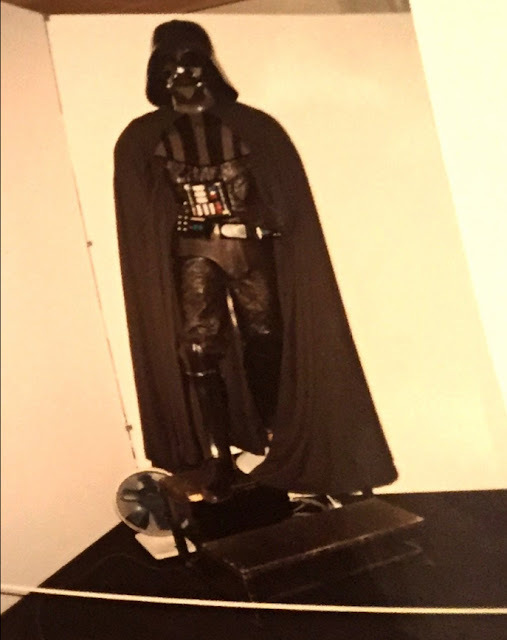 The photo is from a tour of Sweden by Darth Vader that was sponsored by PlayMix. If anyone reading this has one of these posters, please don't hesitate to contact me at rendahl@echobase.nu. One of the most important toy stores in Sweden, Åhlens, launched the figure in a very special way. As part of this launch, PlayMix built an amazing diorama in an Åhlens location. 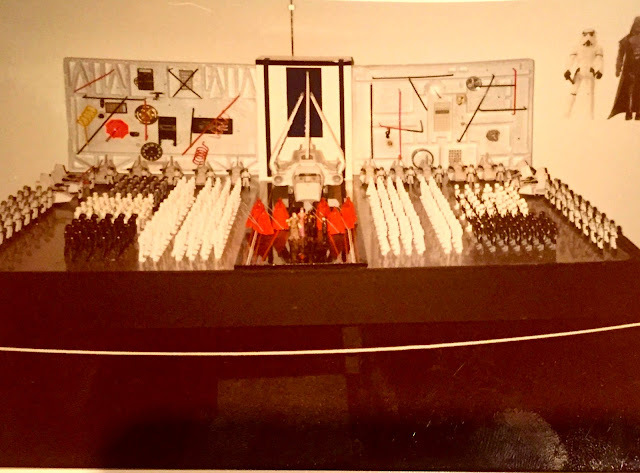 The diorama featured the Imperial Shuttle and dozens of action figures, along with a background consisting of calculators and weird-looking doodads intended to evoke the look of the Darth Star; it's low-rent ingenuity reminds me of the card art featured on Turkey's Uzay line of figures. 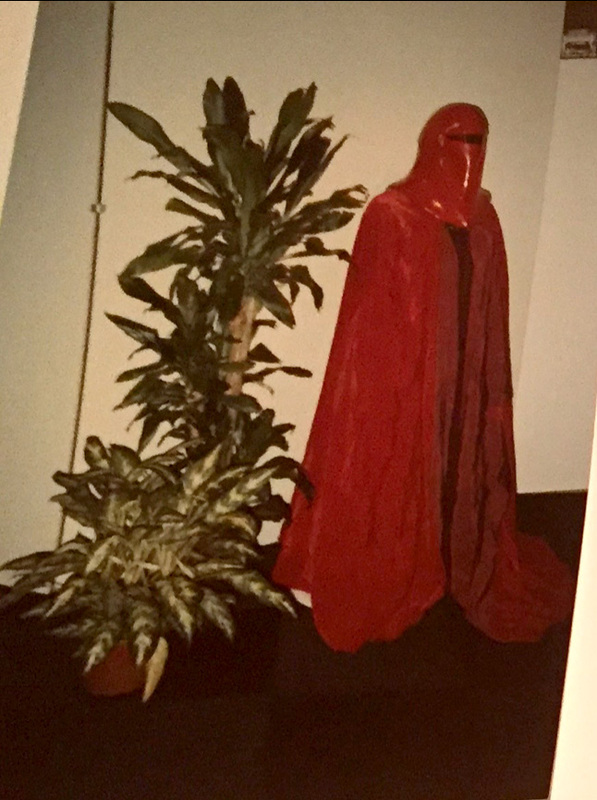 Åhlens also had the Darth Vader tour costume on display (hired from Palitoy), as well as a homemade Royal Guard with a Don Post helmet and a cape sewn by the wife of an advertising staffer. Okay, so it wasn't the most sophisticated set-up. Still, kids loved it. Despite the PlayMix hype, the Emperor was never very rare in Sweden, and shortly after the VIP launch it was widely available all over the country. Regardless, it is surprisingly tough to find a carded Emperor or Emperor cardbacks with Swedish price stickers. So far only Tri-Logo examples have been found. The carded figure actually comes from my home town, Helsingborg, and it was sold in the toy store I frequented as a child. Somehow it managed to end up in the north of Sweden, in the collection of my good friend David Löfberg. Being an ad man by profession, I love stories such as this one. Meeting the PlayMix employees who came up with these ideas and hearing their tales of "tricking" stores into feverishly purchasing a new toy is the kind of thing that keeps me collecting. PlayMix probably sold more Star Wars action figures per capita than any company in the world. Is it any wonder? Good, good... Let the knowledge flow through you.